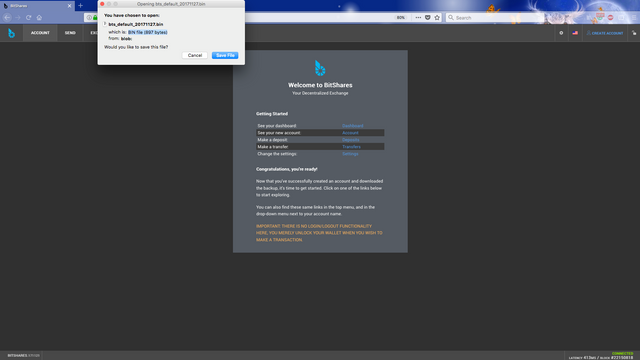 Following feedback on our Rough Guide to Trading on BitShares DEX we decided to bring you this ‘add-on’ supplement. We figured it warranted it's own post instead of altering the original, and to give us more room for advanced (Local) wallet management. The DEX brings us many advantages and freedoms. With freedom, comes power, with power, comes great responsibility! Use this guide to better understand your Cyber equivalent of locking valuables up safely and retrieving them from the blockchain, and making sure you won’t ever lose the keys - from day 1. This is one of the major differences in decentralized world – there is no central authority storing your details, there is also none to recover them. Wallets and their funds remain in your possession at all times, so taking care of backing them up is your sole responsibility. It’s impossible for your funds to be hacked, stolen or lost, apart from by yourself! For new users, Cloud Account is all you need in many cases. 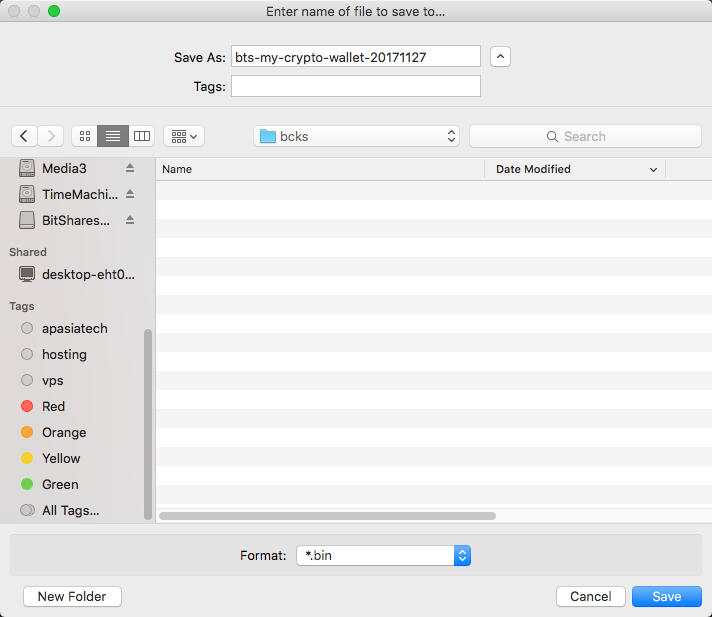 Some however, may want to start off with a Local Wallet back up file - this guide will cover both. So you've decided to stick with Cloud Wallet for now. Then all you require to do is this quick test to continue. Cloud Wallet users can do this as a final step to make sure they are satisfied with their password management. We recommend this for any new account using the cloud login method. 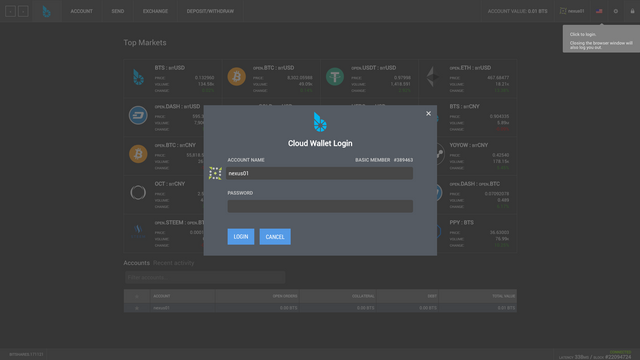 You want to change cloud wallet to a local wallet? If you plan to trade frequently or store value for longer in BitShares, then you will be wanting the best security possible - perhaps with paper or usb keys in your possession. Good news, the following steps will show you how! Here you will see a local wallet is required. 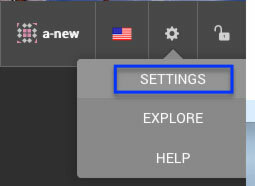 Check the button (2) which will take you to create a new account. 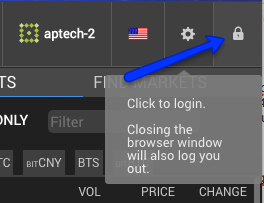 As mentioned already, to switch to Local Wallet, you must do it at account creation, so please follow on below. Local wallet means exactly that - you store the wallet i.e. on your hard drive or USB stick. Your browser is also your wallet, and will hold the 'lock' shown earlier in step 1. 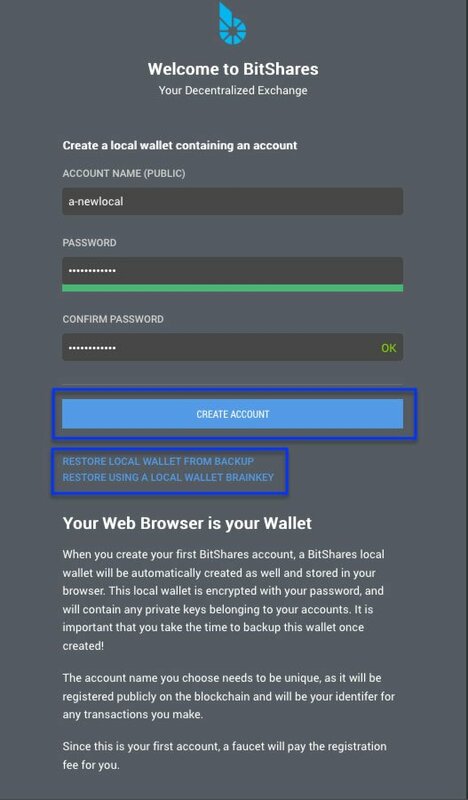 When you change browser, you will need to restore the wallet - and the following steps show how this is done. Local wallets can contain many accounts. Local wallets enable you to create 'cold storage' hardware wallets. Local wallets are the most secure. Note - You cannot convert a cloud wallet to a local wallet. 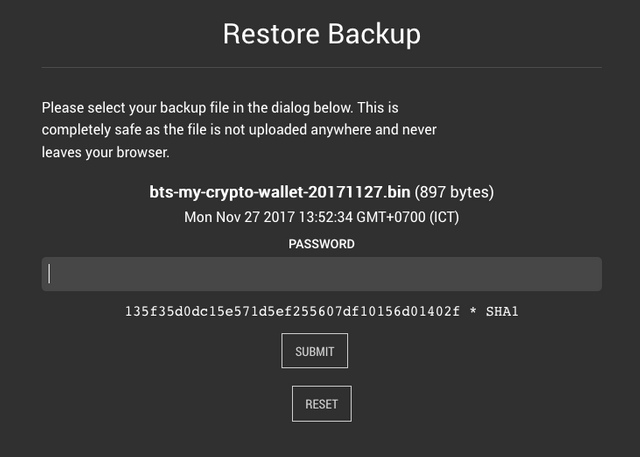 As we can see, there is a green indication showing the passwords match, along with options for restoring a wallet which you would use for an existing backup in a new browser or different computer. Next we are prompted to save the .bin file. Go ahead and even rename it if you like, and save it to your secure local disk or usb drive. 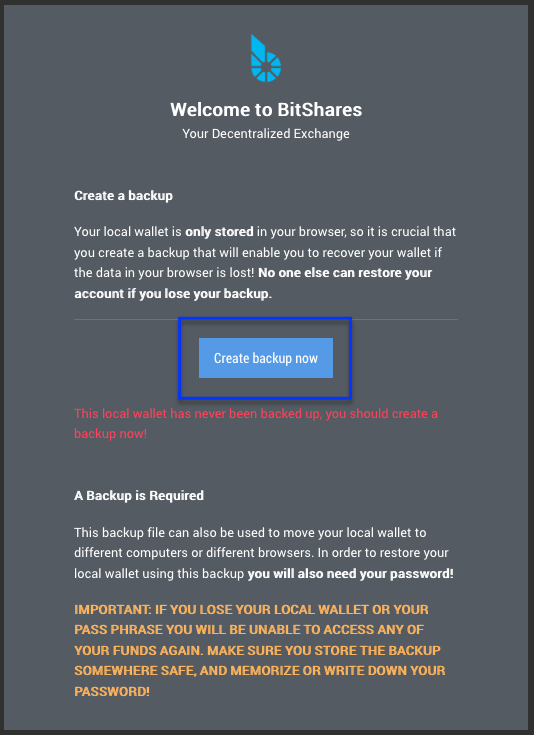 When you want to restore this wallet on any other browser or computer, then you will use these steps, selecting 'restore from backup file' option to upload your wallet. You will still need the password of course. What the heck is a brainkey? Do I NEED to pay attention to this? The answer probably not in most cases. Only if you want to be a nerd, and try out paper wallets. Most of all, you must already have tested other methods to recover your account and Brainkey is recommened for advanced users only. Once you created your account, backed up the wallet file, saved your password safely, and copied it all to a USB. You still have BrainKey as one more possible option for wallet backup (with no warranty, as the author is yet to test it out). 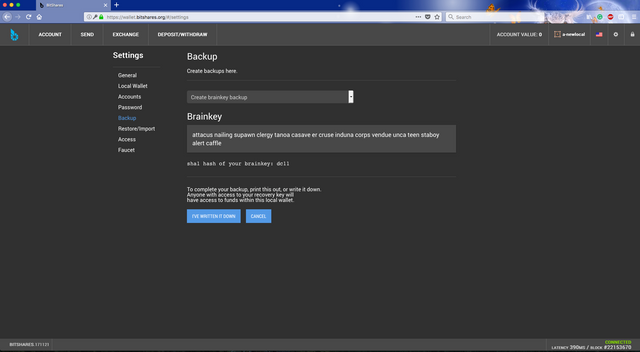 You can go to create a 'Brainkey' backup and print it along with your wallet password. Together, these form a paper wallet. Thanks for reading, we hope by following these steps, you'll find smooth sailing on BitShares DEX! Excellent guide, thank you for putting this together. 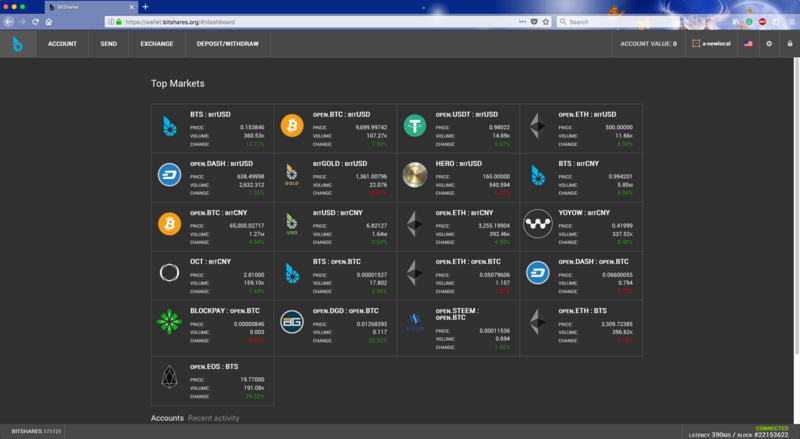 Bitshares is getting easier to use every day, and the new UI is so slick. Wallet and exchange in one place! Thanks! We really needed this! It's our pleasure @stan, we hope it makes wallet management clearer for all users. 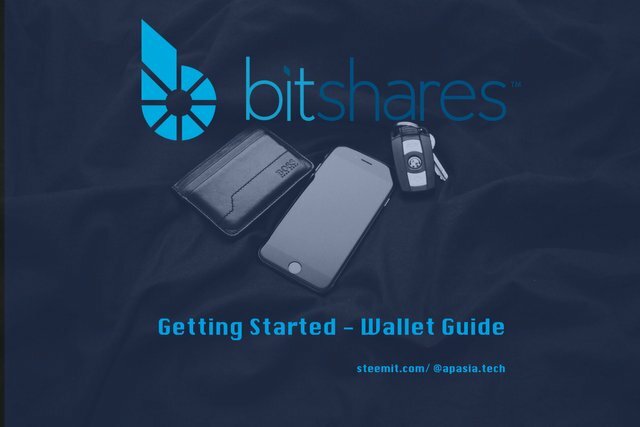 Please check out our previous article on doing exactly that, many thanks for your support and welcome to BitShares - Good Choice! You can only use Android app as a wallet and don't unless you know what it is. I just use the website as per the instructions here. Very nice comments and glad you found it helpful! Awesome a lot of ppl needed this. Yes, we thought it important to separate a whole wallet guide from a starter guide. Glad people seem to like the outcome. 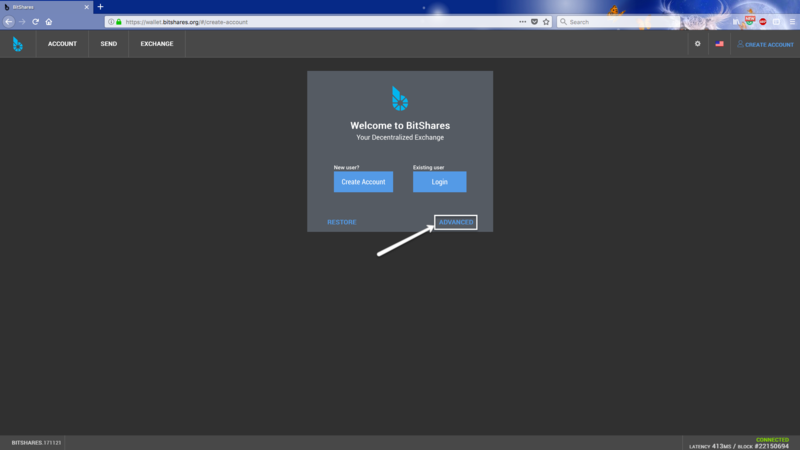 To compare with other DEX wallets, Bitshares is more complete and professionnal. But for the average Joe, it's quite complicated. Maybe a simple and slick wallet without trading (aside the actual one) would convince more users ? These kind of things can also be built by 3rd party providers on top of the BitShares eco-system. That's a great thing about BitShares, anybody can build a slick wallet that manages all the password and support hassles for average joe users. In future also who knows perhaps cloud wallet will be evolved to be even more slick and simple. Fact is, end of the day people want freedom and decentralization, this means you must pay the price - looking after a .bin file and a password is all it requires. bookmarked thanks for this useful guide mate. We are very happy you enjoyed it and found it useful. Wishing all commenters every success with BitShares DEX. Thanks for this kind of helpful article ! We are glad you found it of assistance, there will be more to come soon. @mladenpaunovic - Mladene neka si ziv i zdrav i dobro dosao u Bitshares! Pozdrav sa Tajlanda! Hey, do you have any volume going through your exchange already? I mean are thai people interested in the platform at all? No, UI has not been translated yet, but even without Thai people, currently our RPC is having plenty visits from neighbor countries around. 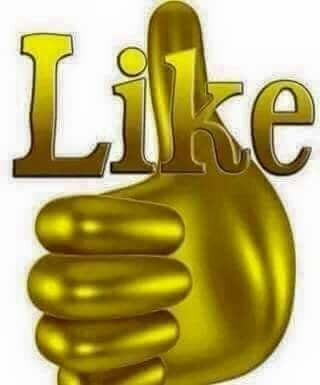 I meant actual thai people that consciously come to the exchange. Didn't know you haven't started yet, sorry! I wish you a binance-level of trading volume, good luck! 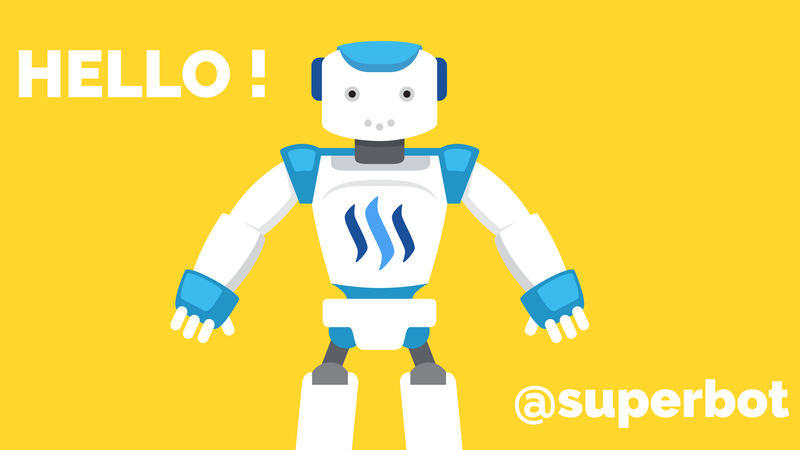 Congrats this post was randomly resteemed & upvoted by @superbot - the Best Resteem bot on Planet ! Send 0.100 Steem/Steem Dollar and the URL in the memo that you want resteemed and upvoted. So don't waste any time ! Get More Followers and gain more Visibility With Superbot . is there really any difference between using the Bitshares wallet directly and OpenLedger? May you have more soon!